An unforgettable aquatic experience to explore the brightly coloured Caribbean underwater world of the Mangrove Lagoon with corals, hermit crabs and volcanic landscapes. The excursion begins with a panoramic coach tour along the southern coast of St. Thomas, which takes us to the Mangrove Lagoon Wildlife Sanctuary and Marine Preserve where a unique experience awaits us. 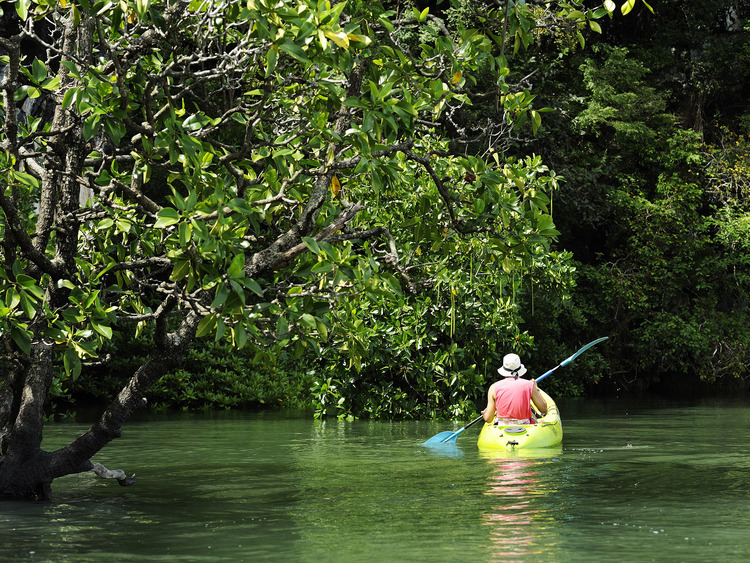 We start off with a tour by kayak around the many small islands of the Mangrove Lagoon, a splendid setting with crystal clear waters that separates Long Point, the southernmost tip of the island of St. Thomas, from the deserted island of Patricia Cay. We then proceed with a walk through the forest and along a beautiful beach with corals and shells and a view of the Caribbean Sea, Buck Island and French Cap, with pools created by the tide, impressive volcanic peaks and the famous Red Point Blow Hole, eroded by the sea out of the rock, out of which water bursts out creating a spectacular spray as waves hit the coast which you can capture in photographs. We have the opportunity to experience the thrill of a Hermit Crab race or participate in a Pirates Treasure Hunt for children, before we start snorkeling in the protected crystal clear waters of the lagoon coral reef, and we explore the remains of a wreck that has been colonised by brightly coloured marine life, in search of shy turtles, rays, starfish, shells, tropical fish and birds and lizards in their natural habitat. On our way back by kayak, we can finally see various types of rays and barracudas. No experience is required for snorkeling. Minimum age: 8 years; minors must be accompanied by an adult. We recommend bringing non-slip water shoes. Snorkeling and kayaking equipment is included.